License, registration and tax costs are impacted by vehicle sales prices and state/local tax rates. In addition to rising vehicle prices, many states, counties and cities have increased their fees related to vehicle purchasing, titling, and registration and licensing. AAA has published Your Driving Costs since 1950. That year, driving a car 10,000 miles per year cost 9 cents per mile, and gasoline sold for 27 cents per gallon. 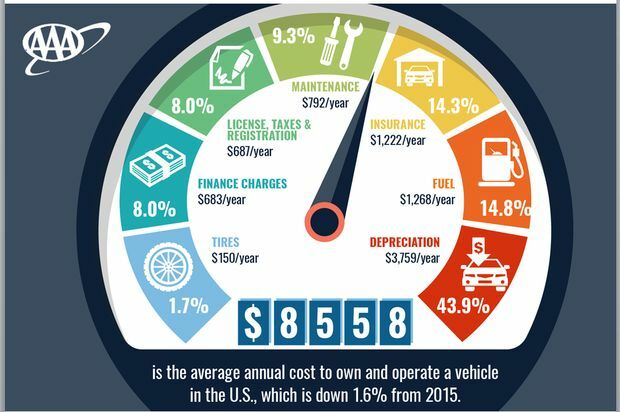 The Your Driving Costs study employs a proprietary AAA methodology to analyze the cost to own and operate a vehicle in the United States. Variable operating costs considered in the study include fuel, maintenance and repair, and tires. Fixed ownership costs factored into the results include insurance, license and registration fees, taxes, depreciation and finance charges. Ownership costs are calculated based on the purchase of a new vehicle that is driven over five years and 75,000 miles. Your actual operating costs may vary. See AAA’s 2016 Your Driving Costs brochure for a list of vehicles and additional information on the underlying criteria used in the study. Motorists can map a route, identify gas prices, find discounts, book a hotel and access AAA roadside assistance with the AAA Mobile app for iPhone, iPad and Android. Learn more at AAA.com/mobile. AAA clubs can be visited on the Internet at AAA.com.